It’s weird to think that The Punisher exists in the same universe as Baby Groot, but he does. The same could be said about draconian New Yorker mob boss Wilson Fisk and loveable talking rock creature Korg, or omnipotent Lord of the Dark Dimension Dormammu and daytime talk show host Trish Walker. They’re all characters cohabitating the same fictional canvas, but the spheres in which they exist somehow feel worlds apart. Granted, with examples as deliberately juxtapositional as these, they should do (though I’d totally be down for a Punisher/Baby Groot team up), but that detachment does at least highlight an area in which Marvel’s grand cinematic tapestry is still fraying at the seams. 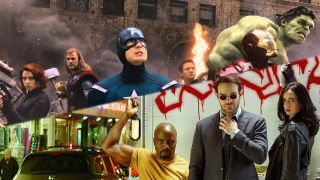 Marvel has been sensible in introducing its street-level heroes to the MCU through grittier, adult-oriented dramas that intentionally shy away from the bouncier entertainment of the movies. But after three years of relatively isolated storytelling, it’s time for the studio to start coalescing its separate televisual and cinematic pillars into something more cohesive. When Marvel first announced that it would be creating a slate of new superhero shows for Netflix, all set within the same universe as its ongoing cinematic project, people began to run wild with theories. Will Daredevil show up in Age of Ultron? Will Jessica Jones introduce us to Doctor Strange? Could this be the beginning of a Heroes for Hire storyline? Admirably, though, Marvel wanted the new shows to focus primarily on their starring characters, dedicating 13 episodes each to tell their stories in a way that made these potentially hamfisted heroes feel both real and relatable. Daredevil season 1 was the beginning of that project and, given that it remains one of the best seasons in the Marvel Netflix pantheon to date, it’s safe to say that this decision was a smart move. Since then we’ve had Jessica Jones, Iron Fist, Luke Cage, a second season of Daredevil, the ensemble miniseries that was The Defenders and, more recently, The Punisher, with Jessica Jones season 2 shortly on the way. That’s nearly 200 hours of television devoted to just five characters, each of whom has had more screen time than Cap, Hulk, and Iron Man put together; if the goal was getting the audience to become intimately familiar with these superheroes, then Marvel has outdone itself. With the introductory groundwork complete, and the question of where to take these characters next, the MCU’s upcoming transition into Phase 4 provides a window of opportunity to let these worlds collide with each other in more meaningful ways. There have been sly winks and nudges in the shows to the wider MCU, of course. Characters often refer to “The Incident” or “The Battle of New York” as a way of saying, “Yes, we are aware of The Avengers”, and there’s even a passing reference to Hulk in Luke Cage. The shows are more than happy to explicitly bleed into each other with shared characters and settings, too, but so far there’s been nothing close to say, Samuel L. Jackson turning up in Agents of SHIELD every now and again. Yes, with the exception of a few bum notes, Marvel's Netflix stuff has been worth watching in and of itself, without any assistance from its big screen brethren, so Tony Stark showing up in Hell's Kitchen should only happen if there's good reason for him to be there (other than Robert Downey Jr. getting another pay rise). But, as both the MCU and its televised counterparts (MTU?) continue to expand their roster of New York dwelling vigilantes, their continued isolation from each other feels more noticeable with every passing Phase. Indeed, whether it’s supernatural earthquakes causing chaos in The Defenders or a domestic terrorist running rampant in The Punisher, the increasingly escalated scale seen in the shows makes it less and less plausible that someone from the MCU wouldn’t have taken notice. Last year’s Spider-Man: Homecoming movie, for example, shows an eager beaver Peter Parker desperate to help out his neighbourhood and be part of a superhero group that he got a taste for in Captain America: Civil War. I’m not sure about the range on those Spidey senses of his, but Queens is just across the river from Harlem and Hell’s Kitchen. It’s difficult to imagine him ignoring homegrown threats like The Hand, Kingpin, and Black Mariah, especially when they’re right next door. It’s similarly hard to picture an event as enormous and apocalyptic as Thanos’ invasion of New York (as seen in the Infinity War trailer) without foolhardy heroes like Iron Fist - now dedicated to defending his city - at least trying to help out in some way or another. Who knows, maybe this will be one of Infinity War’s best kept secrets; one which could actually see people cheering at the unexpected sight of Danny Rand showing up on screen (now wouldn’t that be something). In an age of cinema when Hollywood is determined to create shared universes for just about any vaguely recognisable property with two or more characters, I can understand the hesitation against asking for more. In most cases, I share that fatigue (you won’t find me clamouring for Universal’s Dark Universe anytime soon), but let me try and allay your concerns with this specific Marvel case study. "It’s weird to think that The Punisher exists in the same universe as Baby Groot, but he does." First, this would no longer be crossover for the sake of crossover. It now makes logical sense to integrate these two fully established puzzle pieces into a single, more unified picture, for reasons I’ve tried to explain in detail above. Secondly, this is Marvel we’re talking about; the company who popularised shared universe storytelling in the first place by making it look easy. Feige and company have proven time and time again that they’re capable of bleeding different stories into each other in a way that feels natural, plausible, and experientially rewarding, and I have faith that its synthesis of small screen and big screen would be approached with a similar degree of intelligence and respect for the material. Three years ago, you’d find me commending Marvel’s commitment to giving both the shows and the movies their own space to breathe, without indulging in any unnecessary impulses to mash them together. But the MCU is changing, and I don’t want these Netflix characters to get left behind, forever making throwaway comments about off-screen world-ending threats rather than meaningfully playing their part in the fight to prevent them. You’ve played a strong game so far, Marvel, now it’s time to do what you’ve always done best, and turn your cinematic universe into a televisual one too.